WELCOME, our beloved LGTBQIA+ community and allies. Showcasing queens and things local to Victoria’s amazing drag scene, Extravalanka is an 80’s theme party involving exciting group and solo performances! Independently produced, funded, and organised by performers involved in the show. 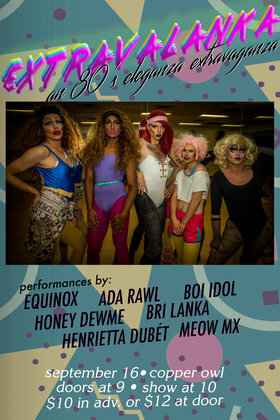 TICKETS: $10 presale via eventbrite (https://www.eventbrite.ca/e/80s-extravalanka-tickets-49188594410) to add your name to the door list, or $12 cash at the door! All ticket money collected is going to the independent artists and organisers which are making this show come to life, so please come and show some support! TIME: To encourage and allow attendance among folks with a "regular" 9-5 weekday work schedule, we have scheduled the doors of the event to open at 9 pm, and we will be starting the show at 10 pm sharp, followed by drinks/socialising with the cast until midnight! The Copper Owl has a midnight curfew on Sunday's, so rest assured that you will be soundly sleeping in time for work Monday morning if that is what you need! VENUE: We would like to thank the Copper Owl for providing a lovely and affordable space to host our event. We are devoted to creating a space revolving around diversity, consent, and respect for our all of our attendees by providing security, gender neutral bathrooms and encouraging suggestions which could make the space feel more inclusive and safe for our typically marginalised community. ACCESSIBILITY: Wheelchair access is unfortunately minimal since there is a large set of stairs into the venue with no accompanying elevator. We recognise that accessibility to LGTBQIA+ events is important for the disabled members of our community, so we are actively pursuing affordable and accessible venues where we can host future events. Due to the premiums involved with booking well-known and accessible venues, we are opening our minds to the possibility of booking alternative accessible spaces which have never been explored previously by LGTBQIA+ event organisers. These options include warehouse space, unused retail locations, affordable community centres, private properties ie: barns, houses, etc.. As long as it is accessible, affordable, has access to electricity, and legal (we don’t necessarily need a liquor license) we are interested! YOUR suggestions and leads should be directed to [email protected] mentioning “Venue Opportunity” in the subject. LAND ACKNOWLEDGEMENT: We, as a group, would like to acknowledge with respect the Lkwungen-speaking peoples on whose traditional territory Victoria/ the Copper Owl stands and the Songhees, Esquimalt and WSÁNEĆ peoples whose historical relationships with the land continue to this day. It is important to know where you stand, and respect the sacrifices which were made in order to call this land our home. CONTACT: For any additional queries or information about the event, please email [email protected] or [email protected] You can also contact Josh Mendis (Bri Lanka) or Thomas Besenski (Ada Rawl) on Facebook.